Provo • What’s wrong with Nick Emery? That’s the latest question du jour surrounding the BYU basketball team, which is 4-2 in WCC play heading into Thursday’s ultra-crucial home contest against Saint Mary’s. However, the Cougars are a not-so-great 12-9 overall, and likely heading toward the worst season in coach Dave Rose’s 14-year tenure. The Cougars were blown out 82-63 by San Francisco last Saturday and Emery was, well, not good. The junior went 0-for-4 from the field and badly missed several shots in 13 minutes against the Dons. Against Pepperdine two nights prior, he was 1-for-4 in 12 minutes. Remember Emery’s freshman season when he averaged more than 16 points a game and nailed 10 3-pointers en route to a career-high 37 points in a 114-89 win over the Dons? That seems like a really long time ago. Emery has chosen not to talk to reporters this month, but Rose was asked Wednesday about the junior’s state of mind after he joined the team the middle of December after sitting out the first nine games due to NCAA sanctions. Rose said Emery is doing a lot better off the court than on it. "... And to where he is now, with the guys, on the team, and his life, from 8 in the morning until midnight, is probably back into that spot. "His game, he is still trying to find it and develop it and defensively, I think he is playing as good of defensive basketball as he’s ever played. I think his energy is terrific. His efficiency on the offensive end is something that he wants to be better at. So we will just keep working on it. • BYU’s women’s basketball team defeated No. 13 Gonzaga and Portland last weekend to move to the top of the WCC standings. The Cougars play at San Diego (1-7, 8-11) on Saturday at 3 p.m. Freshman Shaylee Gonzales leads the Cougars in scoring and assists with a 17.3 scoring average and 4.4 assist average. • BYU’s No. 16-ranked gymnastics team knocked off Utah State in Logan last week. Friday, the Cougars will host the Aggies for their annual Kids Meet at 11 a.m. at the Marriott Center. • The BYU men’s track and field team moved up to No. 9 in the most recent USTFCCCA rankings after hosting the BYU Indoor Invitational. It is the highest the Cougars have been ranked since attaining a No. 8 ranking in 2012. All-American Clayton Young is the highest ranked Cougar, sitting at No. 12 in the 3,000 meter run. • The No. 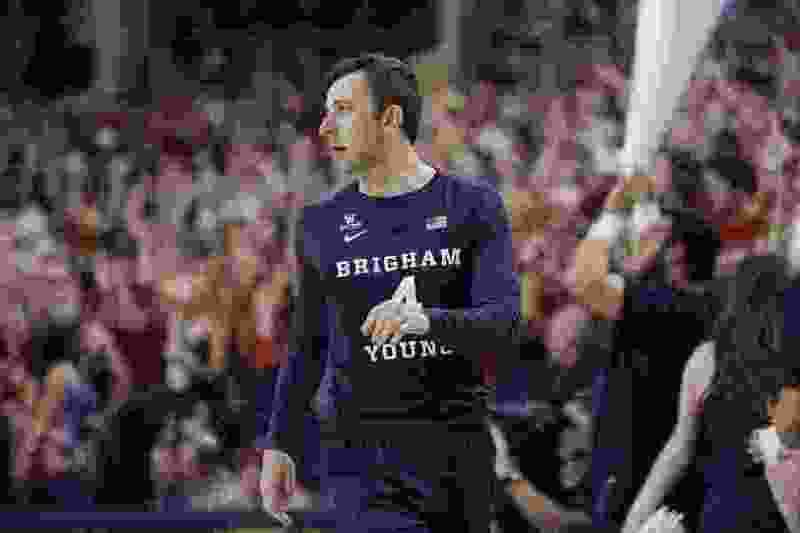 4 BYU men’s volleyball team was forced to play two matches back east within 12 hours of each other, but emerged victorious in both. The Cougars edged Penn State in five sets Friday night, then swept Saint Francis in three sets Saturday morning in a match moved up 10 hours because a winter storm was approaching the East Coast. • BYU senior linebacker Sione Takitaki was a last-minute invitee to the Reese’s Senior Bowl on Saturday in Mobile, Ala. The game will be televised by the NFL Network.